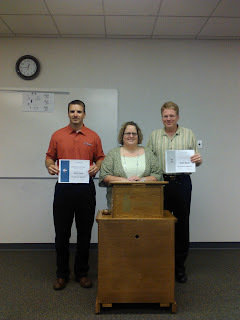 Nick Loney, left, placed 1st in the Humorous Speech Contest and Adin Mann, right, placed 1st in the Evaluation Contest. Contest Chair Rachel Kenney presented them with their certificates. The next round of competition is the Area 51 Speech Contest on September 27th.